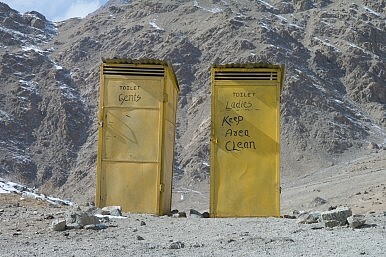 Why the prime minister’s plans for better sanitation may not work as hoped. Prime Minister Narendra Modi wants to see a clean India. To fulfill this ambition, he has launched the Swatch Bharat (Clean India) mission, a supply-side initiative which, among things, plans to build 110 million toilets across India between 2014 and 2019. The underlying presumption is India has a large number of poor people who cannot afford to construct a toilet, and there is thus a need for government intervention. The other important finding is that religion, caste, and culture has an important role in determining whether any particular individual is likely to use toilets. The religion variables demonstrate that Muslim households are 5.4 times more likely to use a toilet than a Hindu household is. Even a Christian household is 1.3 times more likely to adopt a toilet in comparison to their Hindu counterparts. Hindu households have lowest coverage of sanitation facilities in comparison to other religions. This result is surprising, as Indian Muslims are on average both poorer and less educated than Indian Hindus. There are two plausible reasons for it. First, there may be a historical path-dependency related to religion that encourages open defecation among Hindus. Open defecation among Hindu households is linked to the caste system, where the customary circumvention of excreta is sustained by keeping defecation away from the house and entrusting the cleanup job to the so-called “untouchables” or “lower” castes. Many rural Hindu households are averse to the idea of having toilets in the same building as their living quarters. The importance of culture and behavioral attitudes are evident from the Bangladesh experience. Although it has a much lower per-capita income, Bangladesh has a significantly superior sanitation rate to that of India. Only 3 per cent of the population in Bangladesh defecate in the open in comparison to India’s 50 per cent. The majority of Bangladeshis are Muslim. Culturally, Muslims are accustomed to offering prayer (azan) more than four times a day. And, each time they do, they have a practice of washing their hands and feet, and physically cleaning themselves. A campaign that ran in Bangladesh, pointing out that defecating in the open may end up contaminating crops, also helped as it left many disgusted at the thought. Muslim women are more likely to use toilets than their male counterparts due to the perceived benefits of dignity and safety. There is a second approach to understanding why Indian Muslims are more likely to use toilets. We find Muslims are more likely to live in urban areas than Hindus are. The conditional probability of a household residing in a urban area is 0.45 for Hindu and 0.55 for Muslims. Spatially, households living in urban areas are 19 times more likely to use a toilet in comparison to their rural counterparts. The caste system matters. Scheduled Caste (SC), Scheduled Tribe (ST) and Other Backward Class (OBC) households have a lower probability of using a toilet when compared with households from general caste Hindu, Muslims and Christians. People from SC, ST and OBC are more likely come from tribal background. These tribal castes live in relatively inaccessible areas of the nation, and thus having lower access to public goods in comparison to others. Our results suggest that for households living in rural areas and countryside, the conditional probability that these households belongs to SC, ST or OBC is more than 0.60, in comparison to 0.41 for people from other communities. The level of abject poverty is higher among these castes, which could be another potential reason for poorer sanitation coverage among SC, ST, and OBCs. In a scenario when there is no demand for toilet use, and yet the government spends money on facilities, the effort can be counterproductive. Ideally, the government would spend money in such a way that returns from each additional rupee spent on various social sectors provide benefit. Otherwise, the money spent will produce a budget deficit, and eventually inflation. Our study brings out other interesting insights. Examining National Family and Health Survey (NFHS-3) data from India we find evidence about state-level variance in the use of toilets. The NFHS-3 survey interviewed 109,041 households spreading across 28 states in India. The likelihood of households in the Northeast Indian states of Manipur, Mizoram, Tripura and Meghalaya, and the southern state of Kerala using a toilet facility is much higher than that of a household in Delhi (the reference state in our analysis). In fact, in Kerala communities like the Nairs and Ezhavas, and in Meghalaya the Khasi, Jaintias, and the Garo tribes (comprising a majority of the population) practice matriarchy, where women have power in activities relating to allocation, exchange and production. This can also explain the greater prevalence of toilet users in these states. In contrast, households from Rajasthan, Jammu & Kashmir, Himachal Pradesh, Jharkhand, Chhattisgarh and Tamil Nadu are less likely to use toilets in comparison to a household from Delhi. Results also suggest a strong case for imparting education and public awareness, especially, among the female cohort. A household in which a woman has attained higher education (18 years of schooling) is 3.1 times more likely to use a toilet. These results have some obvious policy implications. First, the government should concentrate on creating demand for the use of toilets. Policymakers must ensure that a larger proportion of funds are directed towards social marketing and educating people about hygiene. Second, as female literacy is important, it would be wise to target women and actively involve them in policymaking. Third, there is a need for government policies specifically focusing on improving sanitation in rural areas. These policies can be combined with rural education initiatives, along with measures to improve financial inclusion for rural households. Fourth, the religion and caste-based differentials in the adoption of toilets are more difficult to eradicate. Religion and caste-based differentials are rooted in ingrained beliefs and attitudes. Hindu households can be motivated to adopt latrine use by strictly eradicating the dehumanizing practice of manual scavenging, often performed by the “lower” castes. Finally, the government should empower the “lower” castes, by encouraging them to pursue alternative jobs, and possibly providing them with subsidies to construct latrine facilities.